The flat, windswept plains of the industrial Ruhr region of Germany might not be the best place from which to launch a career as one of the most successful downhill skiers of all time, but then Katja Seizinger is no ordinary athlete. The German dominated alpine skiing in the 1990s like a colossus, becoming the first woman to win back-to-back Olympic downhill gold medals at Lillehammer and Nagano. She powered to two overall World Cup titles in 1996 and 1998 and won 32 victories in downhill and super-G races from 1992 to 1998. She learned the basics not from the cradle but from skiing holidays with her family in France. The stream of subsequent rocket-fuelled performances was not the result of decades of perseverance and dedication, but a sensational natural rapport with speed and snow. Seizinger, whose father runs a steel plant, possessed the innate qualities required to make a champion: nerves of steel, concentration, and tremendous athleticism, which led to her being known as "Kat Woman" and "The Iron Lady". Her fellow athletes agreed that it was not difficult to beat Katja in practice, but getting the better of her in a World Cup race was another matter. Apart from the combined gold at Nagano in 1998, the German also won bronze in the super-G at Lillehammer and bronze in the giant at Nagano. 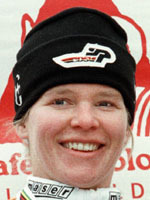 She was 3rd and 2nd in the World Cup overall standings twice; in 1993 and 1995 she lost out to Austria's Anita Wachter and Switzerland's Vreni Schneider only in the final race. In 1998 her sublime style won her six World Cup races in a row, matching the record set by Frenchman Jean-Claude Killy as she won the overall title for the second time after 1996. In June 1998 Seizinger seriously damaged both knees and broke a leg in a crash while training in Schnalstal in Italy and underwent surgery to repair ligaments. Doctors told her she would be out of action for at least six months and Seizinger was forced to re-assess her life. Despite hopes of a comeback, the German decided to quit racing at the age of 27 following a training session with the Austrian team at Solden the following year. She announced her retirement on April 23, 1999 and has split her time between her economics studies and appearances as an Alpine skiing commentator on German television. She also works for her father's company and is expected to take over the management of the business.